Top-seeded Stony Brook Volleyball concluded its season in thrilling fashion, winning the America East Championship for the second consecutive season. The Seawolves defeated the No. 2-ranked Albany Great Danes in five sets and finished the conference season with a perfect 14-0 record. Albany junior outside hitter Chloe Evering scored the first point of the fifth set, but Stony Brook graduate outside hitter Emily Costello fired back with a kill to tie the game. Both teams exchanged blows and struggled to earn the momentum, until a kill by Costello gave the Seawolves the 11-7 lead. 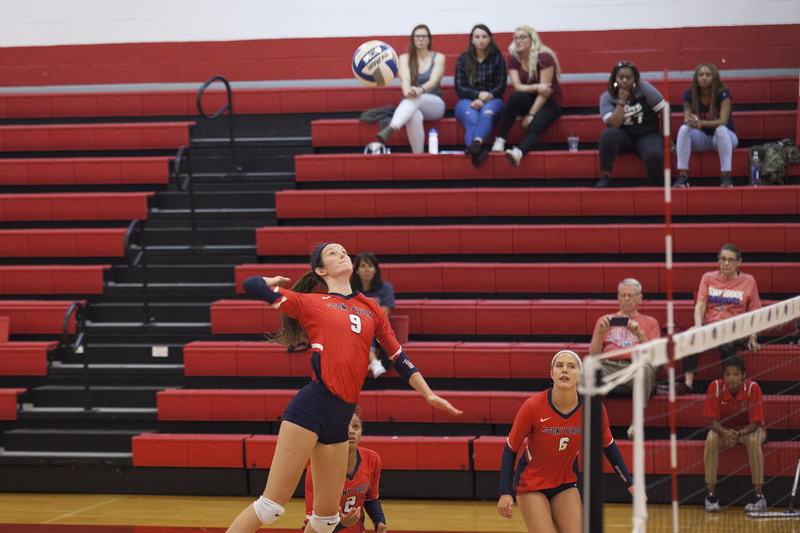 Costello sparked the offensive production by earning five points in the set, including the championship-winning block, handing the Seawolves the 15-8 fifth set victory. Costello found holes in the rigid Albany defense throughout the game and led Stony Brook with 17 kills. The outside hitter combined for 27 kills in both playoff victories and was named America East’s Most Outstanding Player. Though winning the first set was a key component in Stony Brook’s gameplan, the team failed to do so. The lapsed Seawolves defense forfeited 10 total errors in the set while struggling offensively, finishing with a .053 hitting percentage. Albany took the first set 25-17 and a commanding set lead. Belzung shifted the Seawolves focus to cleaning up the attack and targeting a freshman Great Danes backrow. The strategy paid off as junior outside hitter Maria Poole’s blast handed Stony Brook a lead it would not surrender, beginning the second set. The Seawolves went on two separate four-point runs and hit .314 during the set. They cruised to a 25-14 victory which tied the contest at one set each. The Stony Brook crowd erupted following the second set victory and retained a vocal role for the remainder of the match. The crowd followed Albany as it switched sides and attempted to drown out Great Danes head coach MJ Engstrom’s play calling on the court. The stands were so raucous that Albany had to relocate inside the visitor’s locker room to strategize during a third set timeout. Albany’s oncourt struggles persisted as it surrendered 11 total errors in the third set. This assisted Stony Brook to pull away with a 21-16 lead off the kill by junior middle blocker Kendra Harlow. Two Great Danes timeouts were not enough to stop the Seawolves, who took the third set 25-18 and were one set away from winning. Just when it looked like Albany was out, redshirt-junior middle blocker Akuabata Okenwa led them back into the fight. Okenwa motivated her teammates with passionate oncourt chatter, lifting them up after giving points and roaring after they scored. She also rocketed shots which overwhelmed the compact Stony Brook defense across the match. Belzung talked about how the team tried to slow down the middle blocker, acknowledging they would not be able to stop her presence. Okenwa rallied the Great Danes back with eight kills of her game-leading 21 total kills in the fourth set. Albany won 25-21 and tied the game at two sets each. Costello led the team in kills followed by senior middle blocker McKyla Brooks with 13 and junior outside hitter Jordan Gels with 10. Costello, America East Setter of the Year junior LeAnne Sakowicz and sophomore libero/defensive setter Kianni Kerstetter were named to the All-Championship team. With all the accolades the Seawolves earned this season, Harlow believes the team will carry the success for years to come. Stony Brook will await its opponents for the NCAA Volleyball Tournament on the selection show which will be held on Sunday, Nov. 25 at 8:30 p.m. and broadcasted by ESPNU.